Professor Kotler was the first recipient of the American Marketing Association’s (AMA) Distinguished Marketing Educator Award (1985). The European Association of Marketing Consultants and Sales Trainers awarded him their Prize for Marketing Excellence. He was chosen as the Leader in Marketing Thought by the Academic Members of the AMA in a 1975 survey. He also received the 1978 Paul Converse Award of the AMA, honoring his original contribution to marketing. In 1995, the Sales and Marketing Executives International (SMEI) named him Marketer of the Year. In 2002, Professor Kotler received the Distinguished Educator Award from the Academy of Marketing Science. In 2013, he received the William L. Wilkie “Marketing for a Better World” Award and subsequently received the Sheth Foundation Medal for Exceptional Contribution to Marketing Scholarship and Practice.In 2014, he was inducted in the Marketing Hall of Fame. He has received honorary doctoral degrees from Stockholm University, the University of Zurich, Athens University of Economics and Business, DePaul University, the Cracow School of Business and Economics, Groupe H.E.C. in Paris, the Budapest School of Economic Science and Public Administration, the University of Economics and Business Administration in Vienna, and Plekhanov Russian Academy of Economics. 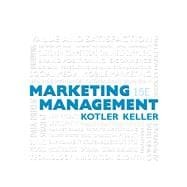 Professor Kotler has been a consultant to many major U.S. and foreign companies, including IBM, General Electric, AT&T, Honeywell, Bank of America, Merck, SAS Airlines, Michelin, and others in the areas of marketing strategy and planning, marketing organization, and international marketing. Professor Keller's general area of expertise lies in marketing strategy and planning and branding. His specific research interest is in how understanding theories and concepts related to consumer behavior can improve marketing strategies. His research has been published in three of the major marketing journals: the Journal of Marketing, the Journal of Marketing Research, and the Journal of Consumer Research. He also has served on the Editorial Review Boards of those journals. With more than 90 published papers, his research has been widely cited and has received numerous awards. Actively involved with industry, he has worked on a host of different types of marketing projects. He has served as a consultant and advisor to marketers for some of the world’s most successful brands, including Accenture, American Express, Disney, Ford, Intel, Levi Strauss, Procter & Gamble, and Samsung. Additional brand consulting activities have been with other top companies such as Allstate, Beiersdorf (Nivea), BlueCross BlueShield, Campbell, Colgate, Eli Lilly, ExxonMobil, General Mills, GfK, Goodyear, Hasbro, Intuit, Johnson & Johnson, Kodak, L.L.Bean, Mayo Clinic, MTV, Nordstrom, Ocean Spray, Red Hat, SAB Miller, Shell Oil, Starbucks, Unilever, and Young & Rubicam. He has also served as an academic trustee for the Marketing Science Institute and is serving as their Executive Director from July 1, 2013, to July 1, 2015. Ecampus has been great in helping me purchase and rent books! Customer service was excellent when I could not figure out what I had done and why I could not find the ebook. Marketing Management: 5 out of 5 stars based on 1 user reviews.